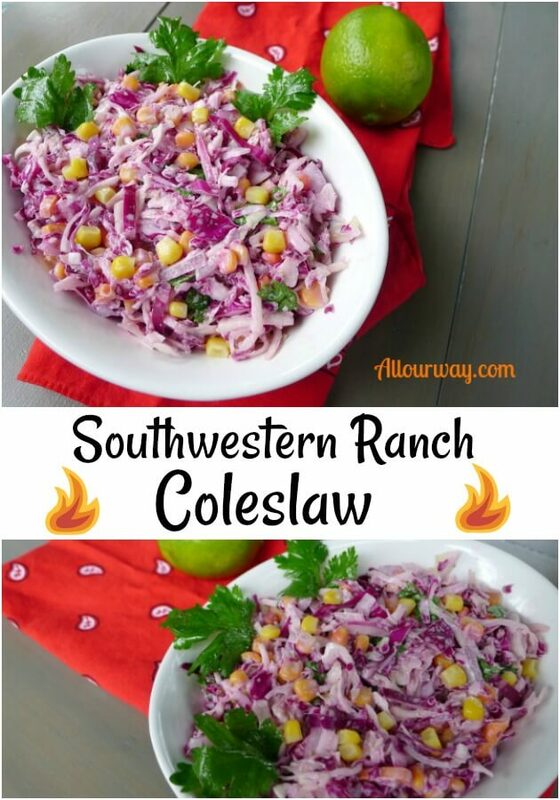 Whenever we have a family gathering at our house, we like to make it into a theme, such as Southwestern, so I knew I had to get Michelle’s, our daughter, Southwestern Ranch Coleslaw recipe. I knew that the flavor of the ranch dressing kicked up with adobo sauce, lime juice, cilantro, purple onion, and corn would compliment the menu for our Southwestern dining al fresco. We had been busy so preparing for our gathering that I neglected to get a centerpiece. 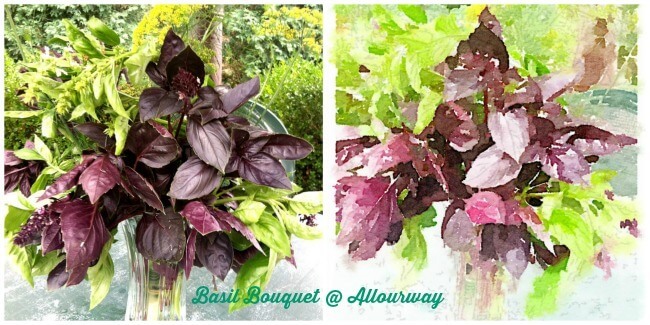 I know flowers would have been nice, but we have such an abundance of basil I decided to make an herb bouquet. I even made a Waterlogue print out of the photo . . . . I thought it would make a great card. We planned the menu weeks before, the pulled pork was made, the drunken chickens were sitting on their beer throne, the southwestern ranch coleslaw was made the night before. 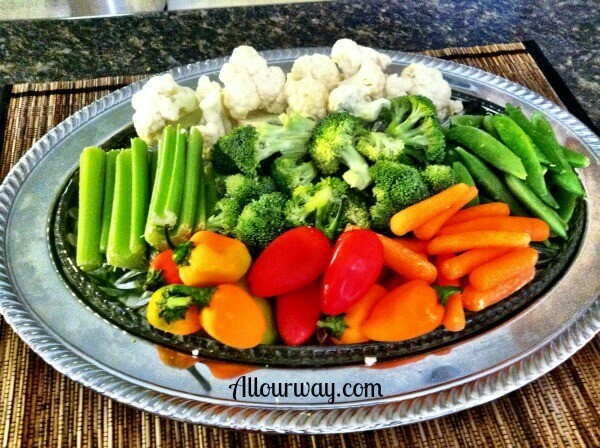 We had fresh veggies for dipping . . . .and to toast our Italian heritage we had an antipasto tray of Genoa Salami and assorted cheese. I wanted to get a photo of the antipasto tray but we have a family of male carnivores. Before I could grab the camera and snap a shot, the tray was empty. The green tomatoes were all ready for frying and as fast as my Honey fried, those crispy tangy morsels disappeared. The delicious potato sourdough buns were made and they turned out perfect. These buns stood up well to the juice from the tender moist pork topped with the Southwestern ranch coleslaw. 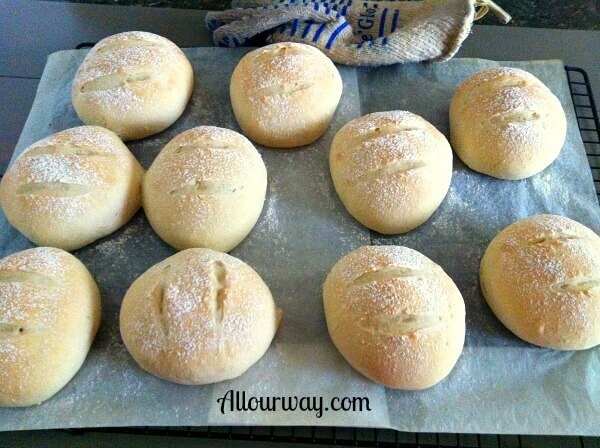 I will post the recipe for these very versatile buns at another time. You won’t want to miss the recipe! The desserts were already in the freezer. Yes, they were the Peaches and Cream Almondine Pie and the Blueberry Bottom Cream Pie. Our kids learned well from their parents to always be prepared and plan ahead, they were considerate enough to bring their own containers for the leftovers. 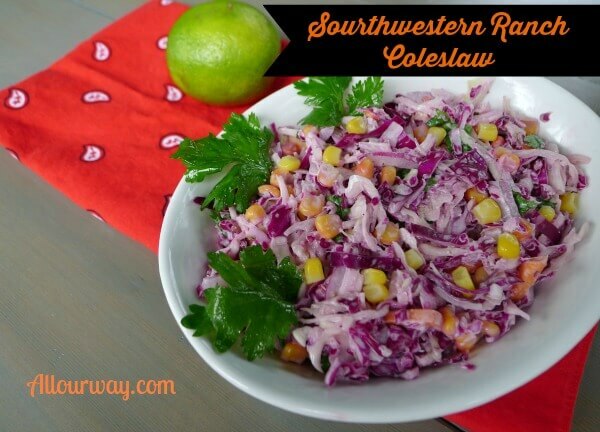 The Southwestern Ranch Coleslaw recipe is easy and quick to put together. The ingredients are easy to find, and you can easily use packaged coleslaw. The store was out of the packaged purple slaw so we bought half a head of purple cabbage and grated it. It’s important to use the original Ranch Dressing to keep the flavor genuine, it does make a difference in taste. Every time the Michelle takes her coleslaw anywhere, she comes back with an empty container. . .
. . . sparkling clean. 1 bag shredded cabbage regular size. 1 bag shredded purple cabbage regular size If you can't find it already prepared you can shred 1/2 of a small head of purple cabbage. Combine all the veggies in a large bowl. Mix the Ranch Dressing, lime juice and adobo sauce and pour over the veggies and stir. Make sure the sauce covers all of the coleslaw. Can be served immediately or let the flavors meld for a few hours. 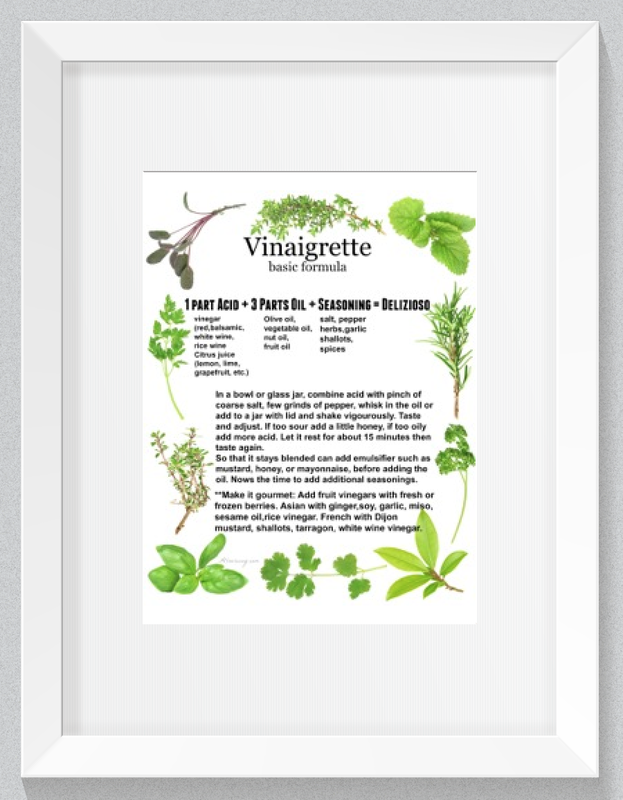 Note: Recipes and content from All Our Way ©2014 are copyright protected. Please do not use content or recipe without prior written permission. If you want to share the information please link to this post. Grazie. Another Note: I am not affiliated with the Ranch Dressing Company. You had me with spicy abodo sauce. I like to add little spicy touch to everything. 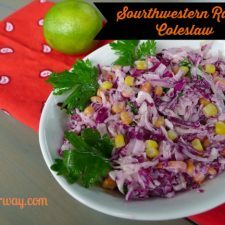 This Southwestern ranch coleslaw is colorful with purple cabbage and creamy I am in for few dig in. Hi, Swathi! We are making it again soon. It sure is tasty and we love the spice of it. If your family likes a little kick, this is it. 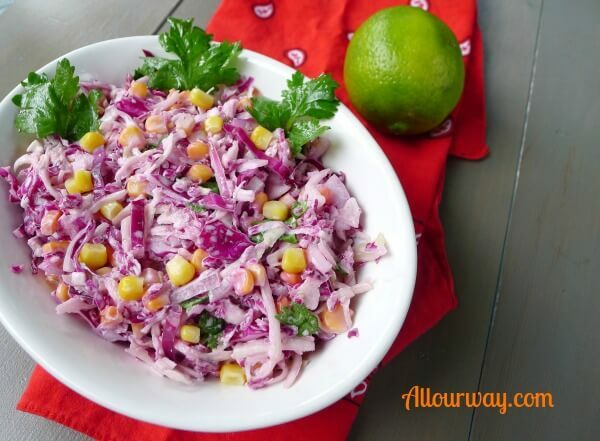 I love a good coleslaw and I bet the smokiness of the adobo sauce makes this amazing! We use lots of adobo sauce and the taste is great! Let me know if you try it! Have a great weekend. I’ve totally been on a ranch kick lately and love adding it otherwise ordinary dishes. I just made a ranch potato salad and I’m secretly over here drooling at the idea of ranch coleslaw, yum! You’re going to love this, Jessica! It gives the coleslaw such a nice kick! Have a great weekend. I love anything with a southwestern flair. The lime and ranch on coleslaw would be so good in summer time! This is my daughter’s inspiration and I can’t believe how good it tastes. The lime and cilantro just scream summer to me. Now that slaw sounds so interesting. I must admit I have only eaten slaw with Pork! Not sure why? But never ever made it otherwise. This looks so awesome, can’t wait to try. Thank you, Veena! I do hope you give it a try. It’s such a great flavor variation. Hi, Molly! 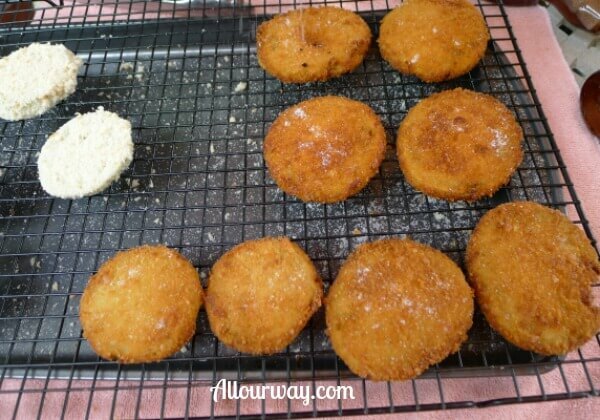 We are partial to fried green tomatoes along with the coleslaw. Great picnic foods! This sounds like the perfect cookout menu, you can’t have pulled pork without slaw. And this slaw sounds delicious! Thank you, Pam! We feel that way too. Happy Independence Day!